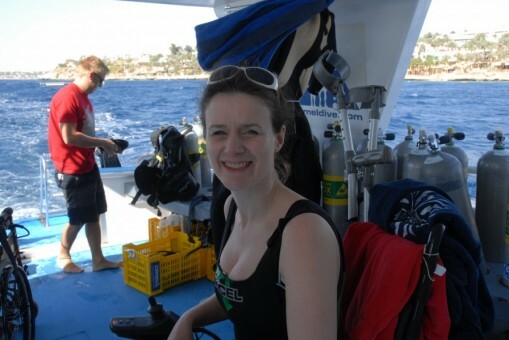 For the final article in our series on Digital R&D Fund projects, we talk to artist Sue Austin about performance art in an underwater wheelchair and her plans to make 360 degrees filming technology more affordable and accessible. It’s not every day that you find yourself discussing the logistics of sending a person in a wheelchair into space – and how you’d then film it with a 360 camera. But after an hour talking to Sue Austin, it’s the kind of idea that starts to feel almost ordinary. Such is the enthusiasm and determination of this fast-talking, quick thinking artist, that what might otherwise be dismissed as hopelessly unrealistic seems entirely plausible. Which is probably why in 2013 Austin was asked to contribute to NASA’s innovation speakers’ forum – out-there ideas are what make her tick. Austin’s Digital R&D Fund project doesn’t involve her orbiting the Earth in a space suit – although she is currently learning to fly – but the space around us and how, as a wheelchair user, it is navigated, experienced and viewed is all part of this year-long initiative. Titled 360 Degrees – A New Angle on Access, it’s a collaboration between Austin and her small South West-based team at disability arts company Freewheeling, underwater photographer Dan Burton (the project’s technology partner), and SERIO at Plymouth University (the project’s research partners). The aim is to build on existing technology to produce a cost-effective system for recording, editing and displaying 360 film – something that is currently financially prohibitive for many artists and arts organisations. Filming in 360 is an area Austin has a high-profile track record in. Presented during the 2012 Cultural Olympiad and shot in 360, her Creating the Spectacle! 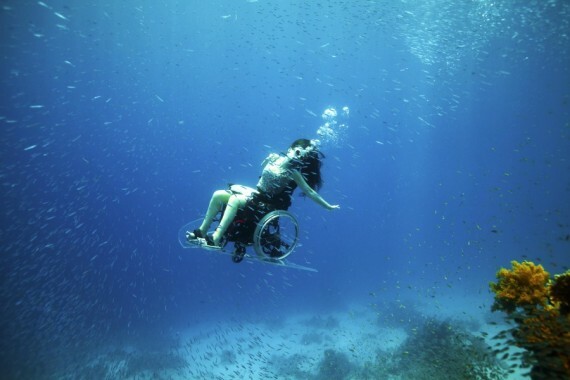 performance saw the artist ‘swimming’ underwater in a specially designed wheelchair. Intended as a celebration of the mobility and freedom that wheelchair access can give, the film of her gliding through seductively tropical waters while wearing a summer dress, sunglasses and breathing apparatus has since become a defining and much-viewed image. Sceptics don’t get much of a look in at ‘Team Austin’, of course. Having worked together for several years prior to the Digital R&D Fund project, they are used to finding technological and artistic solutions which those less in tune with Austin’s can-do approach might not consider. Crucially, nobody on the team is confined to just one task or specialism. “All the people involved take on roles across the project, rather than staying in their area,” says Austin. Building on the research and development process that led to the Creating the Spectacle! commission and subsequent iterations of the work, there is a continuity to the Digital R&D Fund project that reflects Austin’s desire to keep developing the possibilities for filming and displaying 360 film. “Dan, our videographer, has developed a camera system – the EyeMirror – which we’re using for this project, and we’re researching to see if one single camera [rather than multiple cameras] has the appropriate resolution to be used on a larger scale,” she explains. While Austin’s existing installation for Creating the Spectacle! uses multiple projectors and a multiple camera rig, she is now exploring ways that this and other 360 works can be presented in a simpler, more affordable way. But it’s not enough to just find out how to do this – a key part of the project’s research is testing these different modes of presentation on an audience. To do this, work by Austin and photographer and filmmaker Kevin Clifford will be shown at three separate exhibitions. Created in two different capture modes, the films will be presented across four formats. With the exhibitions and workshops scheduled for April and May in Plymouth, Torrington and Salisbury, and an August deadline for delivering research findings and wrapping things up, the project is at a particularly busy stage. But not so busy that Austin isn’t looking forward to other challenges that lie ahead – in particular the small matter of taking to the skies in time for the next Olympics in 2016. “It’s just talk at the moment, but imagine a wheelchair flying off the cliffs above Rio?” Just talk, maybe. But judging by past achievements, you’d be wise not to bet against Austin making it happen. The Digital R&D Fund for the Arts is a £7 million fund available for projects over the period 2012-2015. Up to a value of £125,000, it supports ideas that use digital technology to build new business models and enhance audience reach for arts organisations. It is a partnership between Arts Council England, Arts and Humanities Research Council and Nesta.